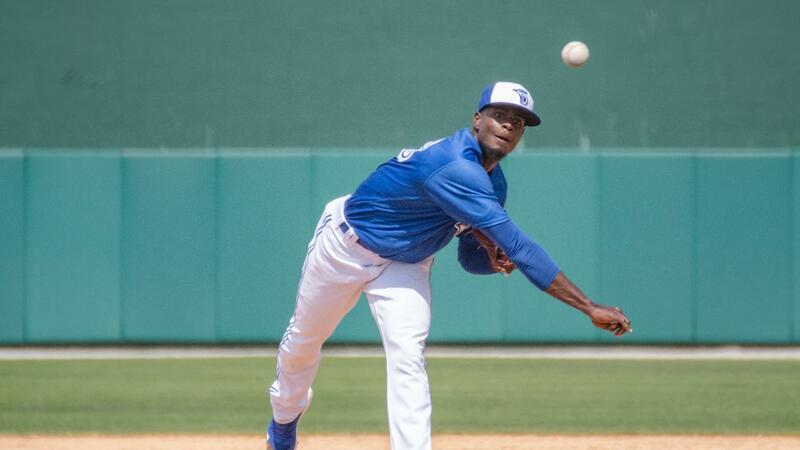 Justin Dillon returned to the mound for Dunedin. His first game for the team since April 28th of last season against the Clearwater Threshers. After giving up a hit to the first batter of the game, Justin Dillon found a groove facing the minimum through the next three innings, retiring eight batters in a row at one point. With two outs in the inning, Demi Orimoloye came up in the bottom of the 1st inning to drive in the first run of the game with an RBI single, scoring Logan Warmoth. Christian Williams drove in the only other run for Dunedin one batter later with a single to left field. The pitchers dominated the game from here on out. It was a quiet three innings after the 1st, seeing just one baserunner reach from a Kevin Vicuna error. Both starting pitchers had good stuff with Justin Dillon posting a final line of no runs on three hits, while striking out five through his 5.2 innings of work. Kyle Young took the lose on the day for the Clearwater Threshers, finishing the day with two earned runs on four hits and not allowing a baserunner after the first inning. Clearwater threatened in the 5th inning putting two men on the base paths with nobody out to start the frame. Justin Dillon went on to record three straight outs to hold the runners and keep his earned run total clean for his first start of the year. Cullen Large had a big day for Dunedin with three hits in four plate appearances. His three hits were good for half of the team total six for the game. Large sent a drive to deep center field for a stand up triple in the bottom of the 6th inning with one out. The third baseman attempted to score from third off a passed ball, but he was thrown out at the plate in a close play to keep the score 2-0. Demi Orimoloye took a walk in the next at-bat, his sixth walk of the series, bringing his OBP to .588 for the series. The inning ended with a Christian Williams swinging strikeout on a 3-2 count. Kyle Weatherly came in to get the hold for Dunedin giving up just one hit in his 1.2 innings of work. The tall righty came in during the 6th inning to halt a Threshers rally that began with a Nick Maton walk and steal of second. Dany Jimenez recorded the five-out save for the Blue Jays. The first save of the young season for the team. Jimenez shut the door on the Threshers, after surrendering a run to Danny Mayer off of a wild pitch, the San Cristobal native struck out the next two batters to end the game. Dunedin open up their first series against the Fort Myers Miracle tomorrow night in Fort Myers at 6:30 p.m. ET. Dunedin has sole possession of first place in the North Division to start the season at 3-1 and Fort Myers split their series with the Charlotte Stone Crabs 2-2.